This Phase II project follows a previous project titled Strategies to Address Nighttime Crashes at Rural, Unsignalized Intersections. Based on the results of the previous study, the Iowa Highway Research Board (IHRB) indicated interest in pursuing further research to address the quality of lighting, rather than just the presence of light, with respect to safety. The research team supplemented the literature review from the previous study, specifically addressing lighting level in terms of measurement, the relationship between light levels and safety, and lamp durability and efficiency. The Center for Transportation Research and Education (CTRE) teamed with a national research leader in roadway lighting, Virginia Tech Transportation Institute (VTTI) to collect the data. An integral instrument to the data collection efforts was the creation of the Roadway Monitoring System (RMS). 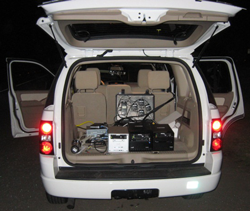 The RMS allowed the research team to collect lighting data and approach information for each rural intersection identified in the previous phase. After data cleanup, the final data set contained illuminance data for 101 lighted intersections (of 137 lighted intersections in the first study). Data analysis included a robust statistical analysis based on Bayesian techniques. Average illuminance, average glare, and average uniformity ratio values were used to classify quality of lighting at the intersections.